This entry was posted in Air Travel, airlines, Baby, Child Development, Family, Parenting, Video, Walking and tagged air travel, baby, child development, family, Newark Airport, Parenting, transportation, Transportation Security Administration, TSA, video, YouTube. It was a long and arduous trip home, but it did not tarnish a wonderful Easter weekend with the entire family. We pulled up to the airport in Chicago this morning with plenty of time to spare. We even breezed through security and things were proceeding almost too smoothly. That’s when we saw that our flight was already delayed by a couple of hours. Actually, being stuck at the airport was the best part of the day. 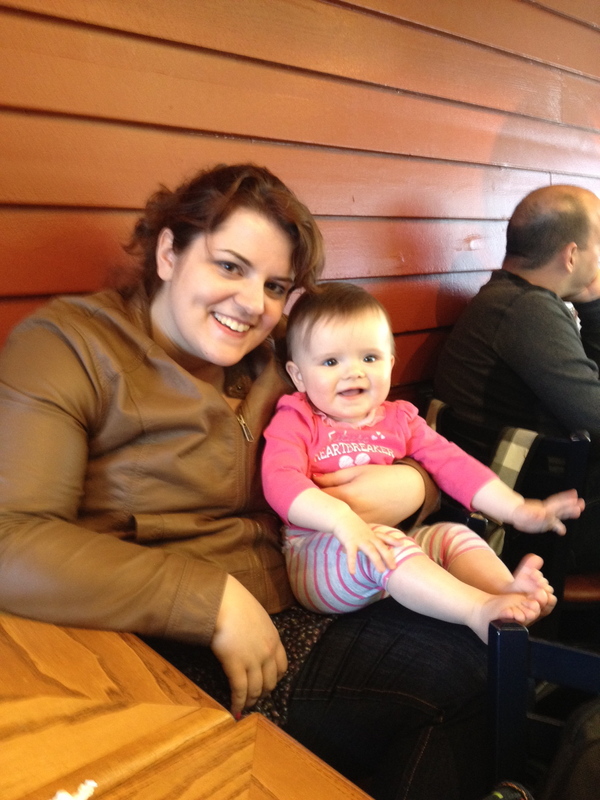 Maddie and Aunt Jacque got to hang out and throw food together at the airport Chili’s. There was no pressure, plenty of food and a happy baby. But once we made our way down to the gate, things got a little dicey. There was a mob of people who had been waiting for some time to get to Newark and United had one person manning the gate. We shuffled onto the airplane and found our seats. We had no idea that our time on the runway was just beginning. Once again, Maddie managed more than an hour of runway naptime only to find her parents wondering if they were ever going to take off. At one point, we were supposedly taxiing down the runway for takeoff when the pilot had to turn around for mechanical issues. Hot tip: Babies as a general rule don’t like to sit still in a plane. Especially if they already were stranded for several hours at the airport due to “windy conditions.” Once we got into the air, Maddie’s patience’s was on shaky ground. We pulled out all the entertainment tricks in the book, but after four hours plus on the plane – Maddie was fed up. You can’t blame her, we could have flown to the moon and back by the time we left O’Hare. After a while, Maddie staged a few mini-meltdowns – but her behavior went above and beyond. She fought the good fight and we were very proud of her. This entry was posted in Air Travel, airlines, Baby, Family, Parenting, Vacation and tagged Air Safety, air travel, baby, Chicago, Children, Easter, family, Newark, Newark Airport, United Airlines.